There can be little doubt that 5G is going to take center stage at this year’s Mobile World Congress in Barcelona. After years of hype without any real products, this is finally going to be the year that 5G — and especially 5G phones — will become available. 5G phones obviously need 5G modems, so maybe it’s no surprise that Qualcomm decided to get ahead of the MWC news cycle by launching its next-gen 5G modem and new mmWave antenna today. As the company stressed throughout its press conference ahead of today’s announcement, it believes that the 5G rollout will be quite different from what we saw with 4G a few years ago. That launch, the company argues, was comparably slow, with only a few operators launching on a single band in a few select cities and with only a handful of available phones. The 5G rollout, however, is going to be global and will feature devices from plenty of OEMs with support from more than 20 global operators. Qualcomm announced its first 5G modem, the X50, in 2016. Today, it is launching the second generation of this technology, the X55. The X55 is the world’s first announced 7 Gbps 5G modem, but what’s maybe more important for your day-to-day usage (once you get a device that uses it) is that it supports every recent technology from 2G to 5G and every spectrum band in any region. It’s a 7nm chip and it has one more important trick up its sleeve: 5g/4G spectrum sharing, which allows operators to support 5G and LTE on the same spectrum. The company expects that OEMs will use the X55 for everything from standard smartphones to fixed wireless receivers, laptops and cars. A modem doesn’t do you much good without an antenna to receive those signals, so Qualcomm also today announced a new mmWave antenna module. 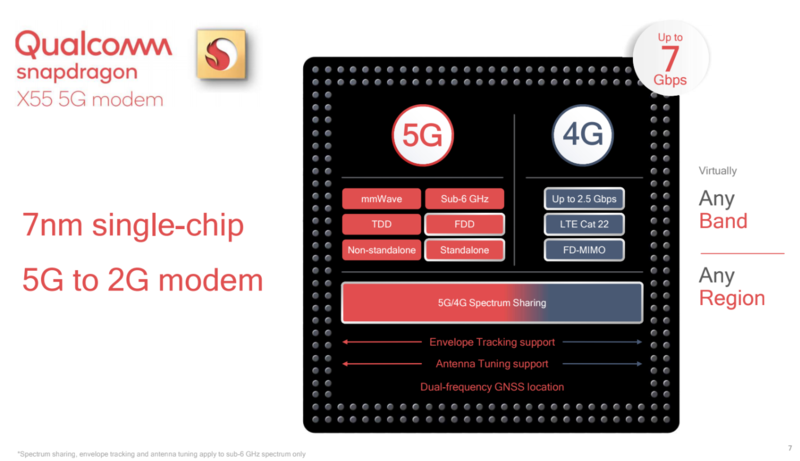 Nothing too exciting there (unless you really like antennas), but the antenna completes Qualcomm’s mmWave 5G lineup in addition to its existing sub-6 GHz antenna and other modules.